This entry was posted in Entertainment, Local business, People and tagged Sally White, Sally's Place, Westport Arts Center. Bookmark the permalink. Sally is one of the town’s jewels and I’ve been going in since my kids were in middle school and high school here. We look forward to gift certificates from Sally’s Place each Christmas — my mother phones Sally from Massachusetts and places her order — she’s done it for many years. They’re always handwritten, as is Sally’s order book, which adds to the charm. See you on the 10th! Dan: Great job (as always) on Westport’s true treasure. I go back with Sally almost 40 years. She’s the best. She has brought many hours of joy to my life and is one of the last links to the great old Westport we remember. I’m still a regular and most proud that she has a big feature I wrote about her hanging in the store. I have to call you out though: you have to go back in and make a few purchases so she is with us for many more years! Walking home from school at Bedford Jr. High I would stop off at Kleins record department to see what new 45 had come in. Sally was the dept. manager. Forty plus years later she is still going strong. Great! Great job Dan! Sally is truly worth her own day on your blog…maybe even an entire week! I have known Sally since 1972 when my band, Repairs, played regularly at La Crepe and Mark’s Place. We had heard that Klein’s was selling our first album Already A Household Word and we all went in to meet her one day. She was terrific then – gracious, intelligent, opinionated, and so entertaining. Today she has not changed one bit. I encourage every one of my Audio Production students at Staples to try to meet her and ask her questions about folk, jazz and even pop music. My own children and their grandmother all shop for CD’s at Sally’s Place. Her store for me is so special, a preservation of all that is good in music and all that remains good about the music business. Each visit to her store is like Christmas morning for me as a child. At 61, Sally still guides me and influences my choice of music. She is so great! What a gift to this great Town! We always knew that Sally White was an important icon in our community and are overjoyed by the positive response to this concert in honor of her many contributions. Thank you to everyone who purchased tickets and to those who have called us and told personal stories of about how Sally has touched their lives. Dan, I too have a confession – while I definitely use all my cd’s and even my LP’s ( I have used them all on my show “Sometimes Classical” on WPKN) I have been an infrequent visitor to Sally’s shop at the end of Main Street. But every time I enter, I see that she is alway ahead of the curve – she has somehow identified that magical or obscure or esoteric item that I thought was my private preserve to play for my listeners. I don’t know how she does it. What a treasure we have, and while her store may not be the most visible (you have to know where to look for it) it certainly is one of the most unique and personal places in town. Westport was once filled with such stores, and the internet will never replace the intimacy and the magic of places like Sally’s. Happy memories of Sally selling me 45s at Klein’s back in the disco era. She always had the weekly Billboard Top 40 list posted with all the records right beneath it. I’m not one for nostalgia, but I really do miss Klein’s. I bought LPs from Klein’s back in the days when Sally worked there. 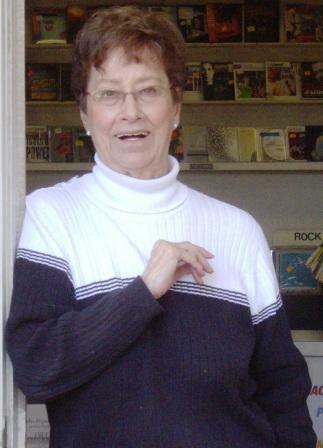 I remember so well how welcoming and friendly she was to all who walked into the record department – she seemed to know EVERYONE! Once she opened Sally’s Place, my Mom would occasionally walk in to the store in hopes that Sally could identify the song my Mom would hum to her because my Mom wouldn’t remember the song title or who performed it. Sally would always save the day – not only would she recognize the song my Mom was trying to sing, but she’d also know the artist. Within seconds, the album was on the counter or being ordered. Sally is a Westport gem! Praise and honor well-deserved… Half my vinyl collection (with some real rarities) I owe to Sally’s great instinct and advice back in the day. Of course I still depend on her for Verve and Bluenote editions. Sally is a fantastic person and its always a thrill to spend time with her when I return to CT for the holidays, but I would love to know how Sally “came late to jazz” when she went to high school with Horace Silver!